Home / beauty / What do you choose to look at ? So I am an upcycling artist. Anyway … I have a problem … In order to upcycle, I have to actually KEEP trash… And everyone agrees that in order to manifest more abundance (more money to put it bluntly!) one has to DECLUTTER ! I decided on a way to handle this problem… I AM decluttering anything in my life that is NEVER going to be used in any kind of art (old clothes, my kids toys, useless papers, etc) and, considering I have a house that is 1000m² (yes, I know, bu it is also a B&B !) there is a pretty giganormous mountain of decluttering going on! Thus my creative space is … full. Crowded ? Messy ? Ugly ? Trashy ? This is a photo taken from my chair. That is what I’m looking at when I work. Sure , as you can see, there is a lot. But the “trash into art” stuff is … BEHIND me! 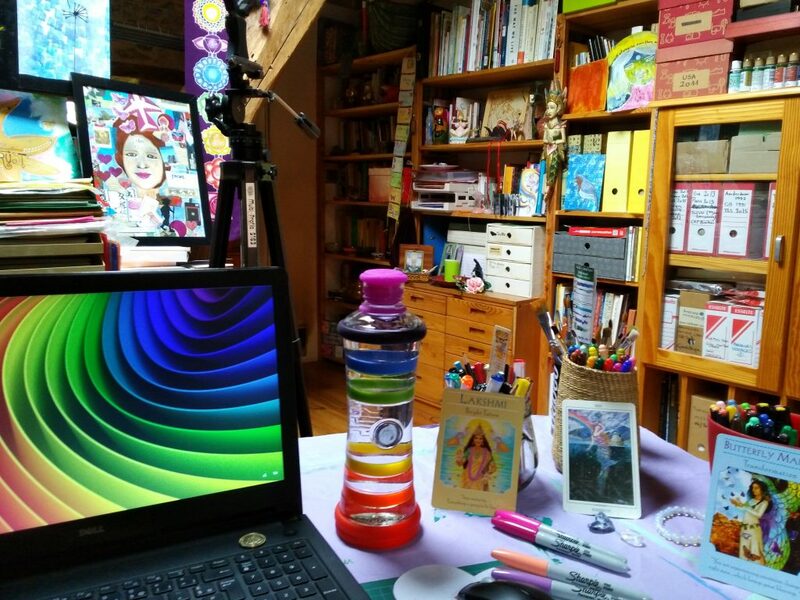 Beauty, inspiration, healing stuff, crystals, artworks I love, rainbow colors, flowers, candles … my lucky gold coin, plus my BEAUTIFUL “informed water chakras colored water bottle” i9 (please ask about that, I’ll tell you all about it, I loooooove it!). It’s so little work and care to create a view of beauty” for yourself … and it changes EVERYTHING! I keep saying that, I know, broken record but Beauty will change the world. It changed mine, it can change yours. Previous ArticleI’m in Japan… Seriously ??? Next ArticleAm I super trendy ? Or just unknown and burying my head in the sand ? I love this(!) ~ your blogs. They are like a mirror of what I feel. And I love the colors you surround yourself with. And…messy? I think not. You are far more organized that I am…..
Hello… I just read your comment .. I think you are the very first “unknown” person to comment on my blog. THANK YOU, my heart is so full of gratitude for your appreciation… Internet is such a crazy good invention … We get to touch so many people so far away … Thank you, thank you ! Today is my 50th birthday and I was thinking … should l keep on blogging ? Does that even interest anyone … And l read your comment … Amazing synchronicity … So I’m off to blog some more!